Let P be a set of n points in general position in the plane which is partitioned into color classes. P is said to be color-balanced if the number of points of each color is at most \(\lfloor n/2\rfloor \). Given a color-balanced point set P, a balanced cut is a line which partitions P into two color-balanced point sets, each of size at most \(2n/3 + 1\). A colored matching of P is a perfect matching in which every edge connects two points of distinct colors by a straight line segment. A plane colored matching is a colored matching which is non-crossing. 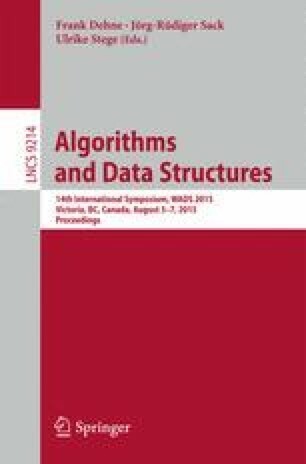 In this paper, we present an algorithm which computes a balanced cut for P in linear time. Consequently, we present an algorithm which computes a plane colored matching of P optimally in \(\Theta (n\log n)\) time.